Every Christmas, I think about Mary giving birth to Jesus. The holiness of it all. The beauty of how she pondered it all in her heart. I always feel such a connection to her from a mother's point of view. This year I, for the first time, feel a special connection to Mary on this Good Friday. Mary, the woman who carried a baby boy in her womb for nine months. Mary, who went through labour pains, giving birth to that baby boy. Mary who raised a son and had to entrust him into Gods care over and over again. She loved her son. When he was sentenced to die, she remained until the very end, witnessing the suffering and pain her son went through. She stayed and entered into his suffering. Her connection as a mother kept her there. I'm sure it was excruciatingly painful to watch. But she stayed. Her love for her son kept her there. Oh the pain she must have felt. Did she beg God to save him? Did she fall to her knees and plead for him to breathe just one more breath? Did she plead for more time with her baby? I did, that cold January Friday. I pleaded with God to breathe life into Mikail; to give us more time with him; to save him-but perhaps that idea of saving him was more saving me from the excruciating pain of grief and mourning, because really, he was already saved. Entering the gates of glory. Sitting at the feet of Jesus. These prayers were not answered--for either of our Mama hearts. But because of that Good Friday, we have hope in the knowledge that because of Jesus' death, we can have life eternal. Because of Jesus' sacrifice that Good Friday many years ago, we get to see Mikail again. Oh the joy Mary must have felt when she got to see her son alive. Oh the joy we will experience one day when we enter heaven's gates and get to hold Mikail again and meet Jesus face to face. This year Good Friday holds a whole new meaning. A new type of holy. 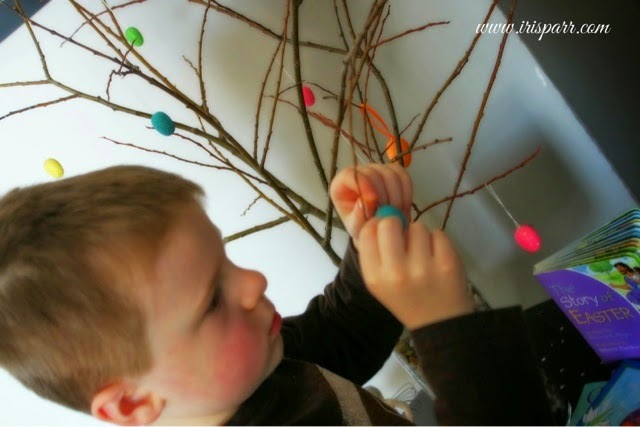 Easter 2014, decorating our Easter Tree. I don't know you, but I really love your blog. Thank you for sharing your heart with the world. Your journey inspires me to hold on for another day and sometimes it's the only place I have to look for assurance that Jesus loves even me. I'm so glad you're here. We go through some tough stuff in life, but the hope we have because of His grace is enough to keep taking one step forward. I'm glad you hold on for one more day...every day. Tough stuff for sure. I hope you're doing ok.